Colin Rand Kaepernick (/ˈkæpərnɪk/ KAP-ər-nik; born November 3, 1987) is an American football quarterback who is currently a free agent. Kaepernick played college football for the University of Nevada in Reno, where he was named the Western Athletic Conference (WAC) Offensive Player of the Year twice and became the only player in NCAA Division I FBS history to amass 10,000 passing yards and 4,000 rushing yards in a career. After graduating, he was selected by the San Francisco 49ers in the second round of the 2011 NFL Draft. 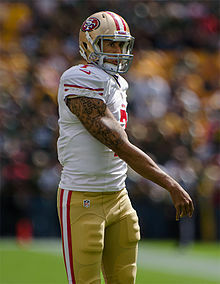 Kaepernick began his professional football career as a backup quarterback to Alex Smith, and became the 49ers' starter in the middle of the 2012 season after Smith suffered a concussion. He then remained the team's starting quarterback for the rest of the season, leading the team to their first Super Bowl appearance since 1994. During the 2013 season, his first full season as a starter, Kaepernick helped the 49ers reach the NFC Championship Game. Over the next three seasons, Kaepernick lost and won back his starting job, with the 49ers missing the playoffs for three years consecutively. He opted out of his contract with the 49ers to become a free agent after the 2016 season. In 2016, Kaepernick became a national figure when he ignited a firestorm of controversy by choosing to kneel on one knee rather than stand while the United States national anthem was being played before the start of NFL games. He described his behavior as a protest against racial injustice in the United States. His actions prompted negative and positive responses. The negative responses included suggestions that players who protest should be fired; other people displayed their disapproval of players' protests by leaving the stadium immediately after the protests or refusing to watch games at all. Positive responses included similar activity by additional athletes in the NFL and other American sports leagues protesting in various ways during the anthem. In November 2017, Kaepernick filed a grievance against the NFL and its owners, accusing them of colluding to not hire him. In 2018, Amnesty International awarded Kaepernick with that year's Ambassador of Conscience award. This page uses material from the Wikipedia article "Colin Kaepernick" (contributors), which is released under the Creative Commons Attribution-Share-Alike License 3.0.